Unique Unbeatable Outrageous 11 Point Guarantee! 4 All Tours Operate In All Weather – We’ve Got The Gear For You To Stay Dry GUARANTEED! 5 You Can See Australian Native Animals In Their Natural Environment – Wildlife Viewing GUARANTEED! 10 Local Knowledge – If We Don’t Know, We Know Who Does GUARANTEED! 1. 100% Customer Satisfaction or Do The Tour Again And Get Your Money Back GUARANTEED! That’s right, we are so confident that you will have a fantastic experience with us that we guarantee it! We GUARANTEE that you will have an Adventure with us on Kangaroo Island instead of just a holiday. You will have experiences to talk about for years to come and memories that will last you forever. In the unlikely event that you are not completely satisfied with the tour, you may simply fill in one of our feedback forms describing why you are disappointed, (so we can improve your experience and our product) return it to us within thirty days, and we will issue a full refund for what you paid. We want you to have the absolute best experience possible! Your safety is our first priority. We adhere to strict safety standards on all of our tours. Over 90% of our guests have never ridden a quad before they come to Kangaroo Island Outdoor Action. All quads for children and inexperienced riders are either fully automatic or semi automatic. All safety equipment such as helmets and goggles is provided and meets Australian Safety Standards. We have trained thousands of first time riders on our purpose built practice tracks complete with safety barriers. While you are on tour with our experienced guides, you only ever have to ride as fast as you feel safe and comfortable, there is never any pressure to keep up to the guide or other riders. All tours are adapted to the abilities of the riders and you only stop learning when the tour is finished. At any time during the tour, if you no longer feel safe or comfortable riding, you can complete the tour as a passenger with the guide on one of our specialised multi-seat ATV’s. At any time during the tour, if you, or your child, or our highly trained guides, feel that your child has had enough, that their concentration is slipping, or they are no longer riding safely, they can complete the tour as a passenger with the guide on one of our specialised multi-seat ATVs. If you are an experienced rider please let us know when booking so that we can recommend the right tour for you. You also have the option of the Sports Upgrade, a more powerful sports quad with gears (only available for riders aged 16yrs and older) that can be used on any tour. As soon as all riders have demonstrated that they can ride in a competent and controlled way on the practice track, the tour can begin. As always, the tours are adapted to the abilities of the riders so as long as you are riding safely, your tour will go further and travel quicker. Don’t let ambition exceed ability! As a member of the Support Group for the development of Activity Safety Guidelines (ASG) for Quad Bike Tourism, Brenton has been working with TIANZ (Tourism Industry Association New Zealand) towards the implementation of improved safety standards for the industry. You are safe in the knowledge that you are touring with the industry leader and that Kangaroo Island Outdoor Action is a Quality Accredited business with the Australian Tourism Accreditation Program. Kangaroo Island Outdoor Action is committed to minimising the impact of its operations on the environment. Kangaroo Island Outdoor Action is the first Quad Tour Operator in the world to achieve the trilogy of the internationally recognised. 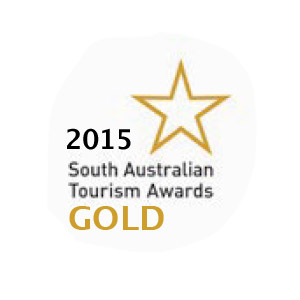 Kangaroo Island Outdoor Action recently received a Gold Award for Ecotourism at the 2013 South Australian Tourism Awards. Kangaroo Island Outdoor Action participates in a Government Certified Carbon Offset Program and you can help to contribute to protecting the environment by offsetting the carbon emissions generated on your quad tour from as little as 25 cents per person. Kangaroo Island Outdoor Action proudly sponsors and provides staff and equipment for Clean Up Australia Day. On your Edge if the Earth Quad Adventure, you will have the opportunity to assist your guide in removing any marine debris that may have washed ashore on the remote and secluded beach that you will get to visit. This means that you can enjoy your adventure safe in the knowledge that we are protecting this unique natural area for future generations to appreciate and enjoy. 4. All Tours Operate In All Weather - We’ve Got The Gear For You To Stay Dry GUARANTEED! Because we are located at Vivonne Bay, on the south coast of Kangaroo Island, the average rainfall is a lot lower than further inland. Even on rainy days we often only have scattered showers and since the quads can travel both faster than the clouds and in different directions, it is easy to stay out of the rain. Your tour equipment includes optional wet weather gear which utilises the latest technology in waterproof and breathable fabrics to make sure you stay dry and comfortable no matter what the conditions. On days that are forecast to be very hot, the early morning and evening Quad Tours are the ones to choose. Cool, southerly, sea breezes are common at Vivonne Bay during the summer, and occur nearly every evening which can make it the perfect place to spend the last part of the day. Always feel free to call our office to take advantage of our local knowledge and get an on the spot weather report. 5. You Can See Australian Native Animals In Their Natural Environment - Wildlife Viewing GUARANTEED! We guarantee that we can show you Australian Native animals in their natural environment during your quad tour. Animals that are commonly seen on tour include Kangaroos, Tammar Wallabies, Koalas, Rosenberg Goannas, Short Beaked Echidnas and Wedge-Tailed Eagles. With many Australian native animals being nocturnal (active at night), it can be difficult to see them during your stay. Different animals can be found at varied times of the day and the longer your tour, the better chance you have of seeing more animals. At Kangaroo Island Outdoor Action, your guide knows the places where you are most likely to see native animals during the day, take advantage of their local knowledge. We guarantee you will see the Kangaroo Island Kangaroos up close in their natural environment when you choose the Sunset Kangaroo Safari and ride on the last quad tour of the day. If observing the wildlife is your priority, please let us know during booking so that we can recommend the right tour for you. You could have your very own tour, personalised just for you. While you could join a small group for your chosen quad tour, particularly when it is busy, if no-one else is booked in for your tour, you are guaranteed your tour will go. We just love going for a ride too, and will be glad that you want to join us. You will get to experience the absolute best possible tour as it will be totally tailored to your skills and interests. If you want to guarantee that your tour is just you and the guide, you can opt for the Private Tour Upgrade and experience the ultimate tour designed totally around you. We understand that your plans might change upon arrival on Kangaroo Island, and that you may need to reschedule your tour to a different time or date. We are very flexible and can make quick changes easily for you. Once your Kangaroo Island Outdoor Action booking is confirmed, you’ll get a voucher with complete reservation details, including Kangaroo Island Outdoor Action contact details. You can call or email us directly with any last-minute questions or date-change requests. And we’ll look after you, subject to availability of course! Don’t forget to mention you hold a confirmed booking voucher. What if your preferred dates or times are not available? As the holder of a confirmed booking, you get priority. We’re open 364 days a year (we spend Christmas Day with our families), and operate multiple tours every day. Call us as soon as you have confirmed your booking to choose a time that suits you. In the unlikely event that we can’t fit you in, you will get a full refund. But don’t miss out, call early, give us at least 48 hrs notice or more, and secure your preferred time and date. 8. Small Client to Guide Ratio GUARANTEED! All of our tours maintain a small client to guide ratio. There are no minimum numbers for any of our tours. Safety is the first priority at Kangaroo Island Outdoor Action and we are focussed on maintaining high industry standards. The client to guide ratio depends on the experience level of the guide and the clients. It is usually less than 6:1 and never exceeds 8:1. Extra guides, assistant guides or guides under instruction can also assist the lead guide on your tour. All of our guides are qualified in first aid, and carry an extensive first aid kits and phones/radios for emergency communications. Smaller groups on tour allow for a more personalized trip and lead to a better experience. Small groups generally take less time to put on their safety gear such as helmets, goggles and gloves and also require less time on the practice track than large teams. This means you spend less time waiting for others, spend more time riding your quad on your tour, and have more time to spare at the end of the day, relishing your accomplishments. Small groups also have more inherent flexibility to accommodate different levels of skill within your group. If you have a larger group, we will provide more guides. This is subject to availability and pre-booking a large group is essential. For the absolute premium Quad Tour experience, consider the Private Tour Upgrade for your group. The tour then comprises just you, your family or friends, and the guide. This guarantees the tour will be tailored to your abilities, interests and requirements and ensures that your group will have the best possible experience. Great adventures start with great gear. We believe there is no substitute for quality and reliability. We guarantee that all of the equipment at Kangaroo Island Outdoor Action is top quality and of the highest possible standards. You will be riding on the latest quads from reputable manufacturers such as Honda, Yamaha, Suzuki and your guides are on the purpose built ATVs from Polaris in the United States. All of our quads comply with the American National Standard ANSI / SVIA – 1 – 2001 for four wheel all-terrain vehicles (ATVs). Our full face motocross helmets incorporate the latest in lightweight fibreglass composite technology and all comply with the stringent Australian/New Zealand Standard (AS/NZS) 1698. In order to maintain the highest standards of hygiene, disposable hairnets are required to be worn under the helmets and the helmets also have removable liners which are washed regularly. Goggles are provided for all riders, meet Australian Standard AS 1609 – 1981, are cleaned after every use and replaced regularly as part of our Continuous Improvement Program. Protective Motocross gloves are provided and motocross pants are available if required. Your guide will take the time to ensure that all of your equipment fits comfortably and correctly. All equipment at Kangaroo Island Outdoor Action is regularly cleaned, maintained and replaced as required as detailed in our Australian Travel Accreditation Program (ATAP). The highest standards of equipment guarantee you the safest and best possible experience. The best experiences on your holidays are the result of getting the best information. Brenton, the owner of Kanvaroo Island Outdoor Action, grew up on Kangaroo Island and has over 40 years of local knowledge that he will share with you. You will benefit from our experience as we know the places and times you are most likely to see native animals on your tour and how to best observe them without scaring them off. You can learn about the history of the area, hear local stories and get the most up to date traveller information. From the best places to eat and stay, estimated travel times, suggested itineraries, not to be missed experiences, little known beaches and much more, the answer is yours from our experienced crew. You can ask Andrew for local tips on fishing (he is the expert) or Brenton (who grew up on the western end of Kagnaroo Island near Flinders Chase National Park) for the best out of the way places to visit. Ask a local, our enthusiasm is infectious, our information is invaluable. We guarantee to stay in touch with you and provide excellent customer service after you have contacted Kangaroo Island Outdoor Action. We guarantee to provide you with the most up to date information regarding your travel to Kangaroo Island and ways that you can turn it into the trip of a lifetime. In the unlikely event that we need to reschedule your tour (eg in case of extreme weather conditions), we will contact you as early as possible. We guarantee to treat you as not just a valued client, but as a friend.